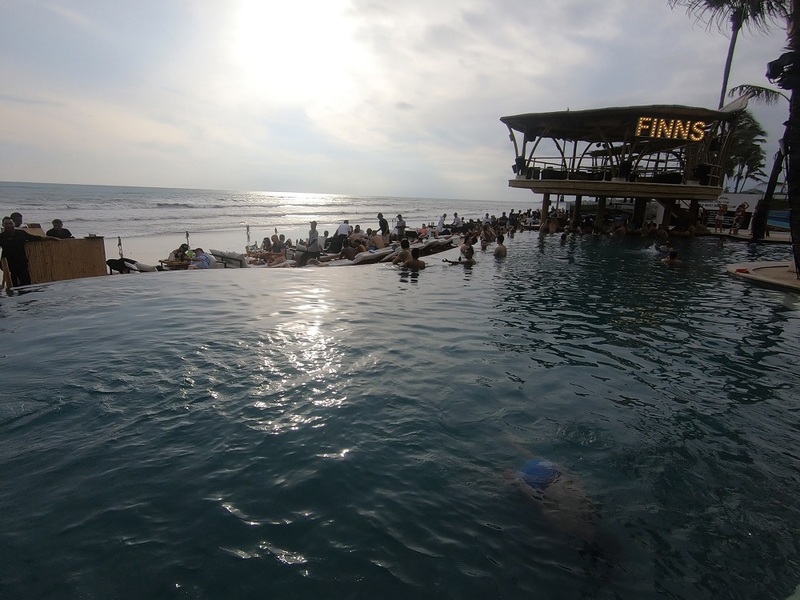 Located in the heart of Canggu Bali is the wonderful oasis that is Finn’s Rec Club. 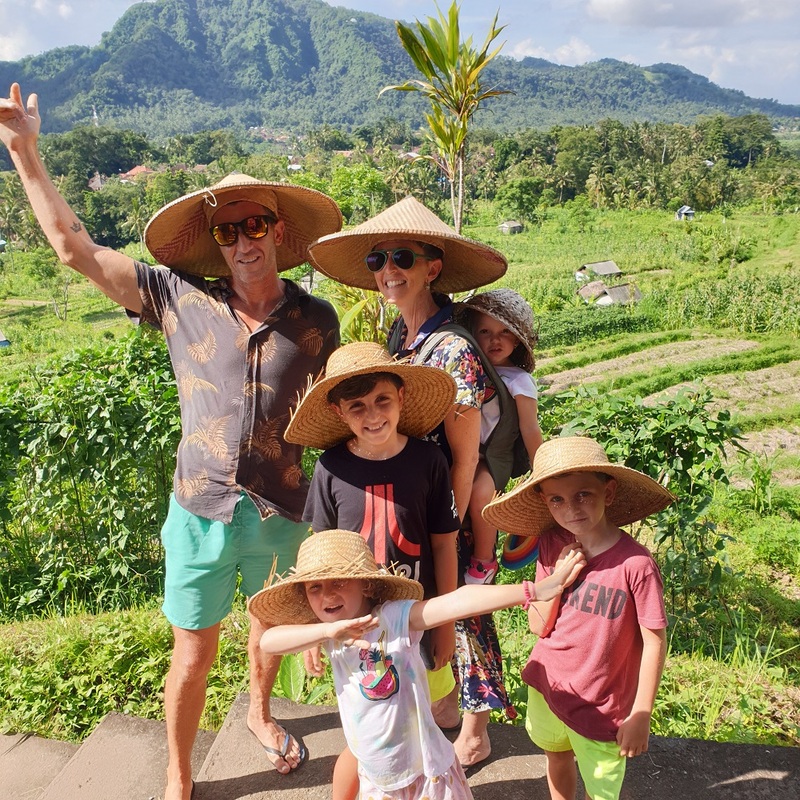 This amazing place, formerly called the Canggu Club has been the darling of expats and tourists alike for many years. This is thanks to its beautiful country club like atmosphere with a hearty sprinkle of fun for children of all ages. Where is Finn’s Rec Club? Which Pass do I Choose? 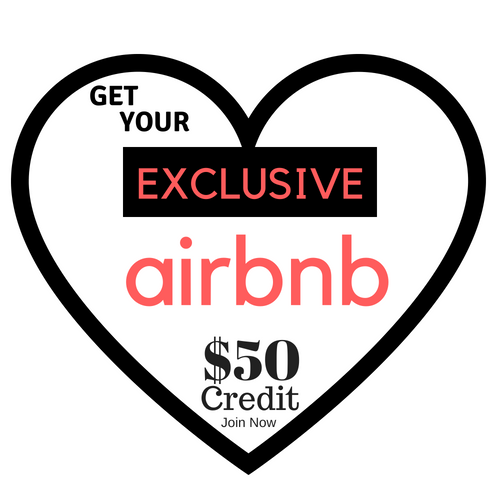 Perfectly located and close to anywhere! 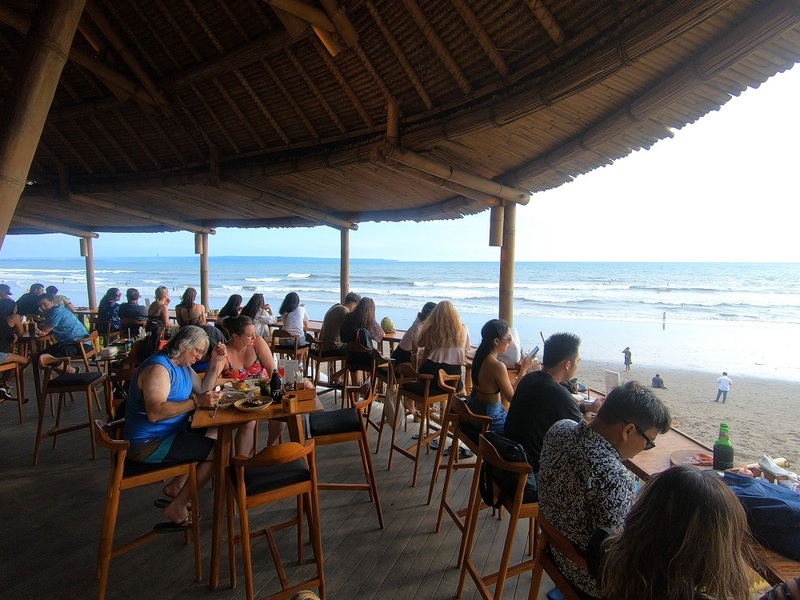 Finn’s Rec Club is a 10 minute ride from down town Canggu, and only 10 minutes from the bustling Seminyak. It is surrounded by a few remaining rice fields which helps to give you that prestigious feel. As you pass through the security gate and continue up to the entrance way, you begin to feel excited. Especially once the kids catch their first up-close sight of those waterslides! Speed slides, the Super Bowl and Big Red will delight your kids for sure! This was not our first visit here. 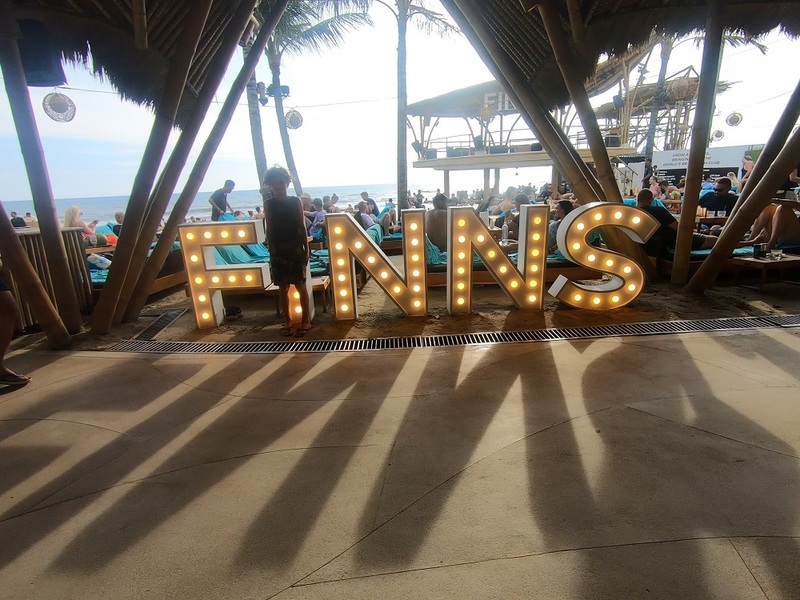 We have known about Finn’s or Canggu Club as it was known back then, for many years now. It has always been a feature on our Bali itinerary. 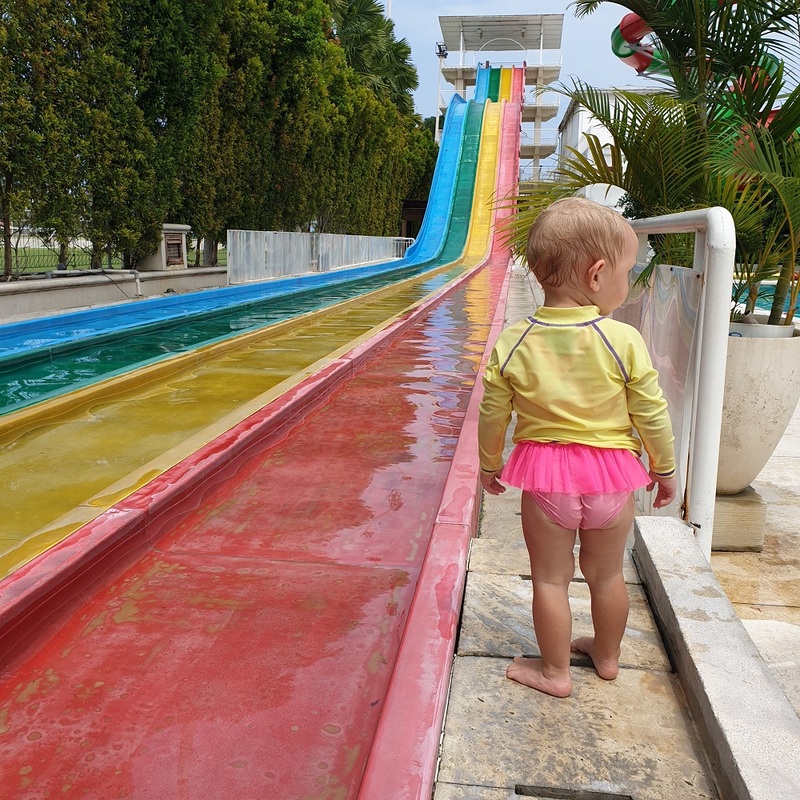 We had only been to Waterbom Bali a few days prior. Finn’s Rec Club definitely had big shoes to fill! We caught ourselves a taxi here from Berawa Beach which cost 30,000IDR. It took a lot of hard bargaining to get it down to that price. The taxis in this area refuse to put on their metres and Bluebirds are not allowed to drive around looking for fares. There seems to be a lot of taxi hierarchy going on within the different areas and factions in Bali! But that’s another story. On arrival you are greeted with the most serene and polite smiling staff! They ask you to sign an injury waiver before proceeding to selecting which type of pass you are after. The security guy at the gate then checks your bag as no outside food and drinks are permitted inside. But he did let me keep the baby’s water bottle. 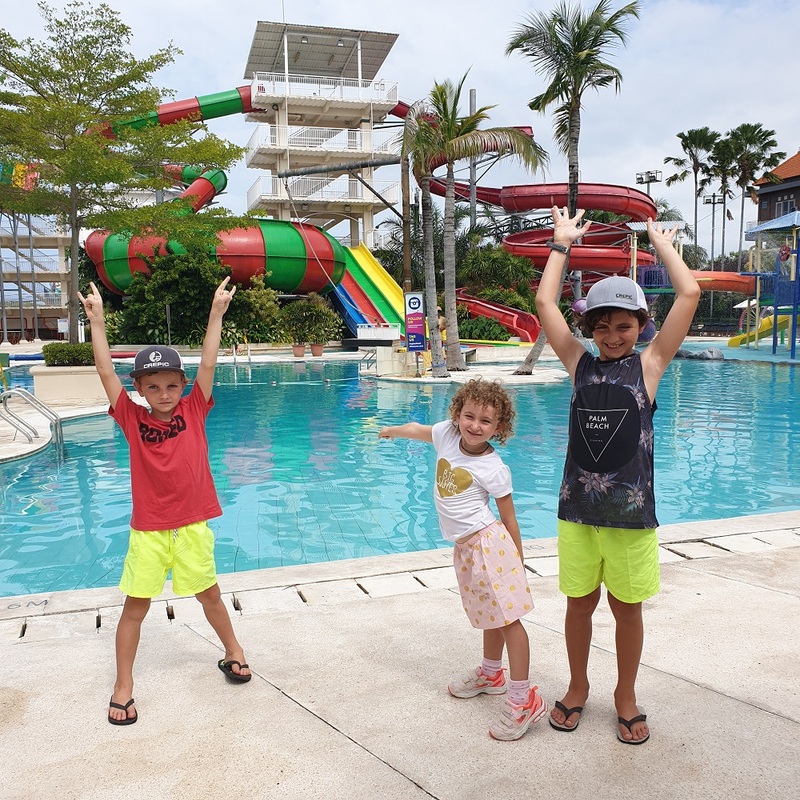 Entrance to Splash Water Park including waterslides, a day bed, and 25m lap pool. 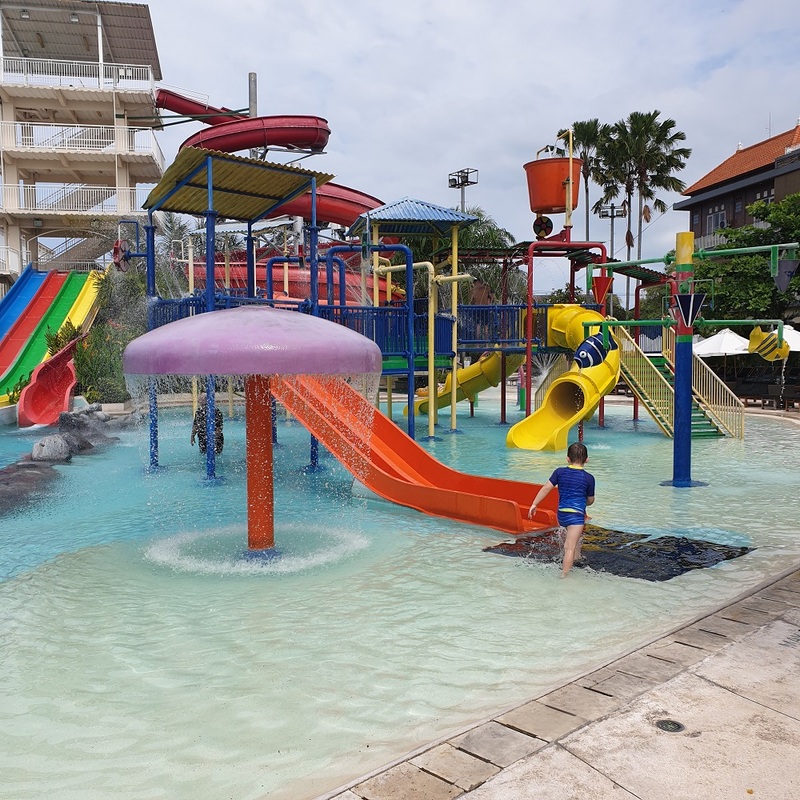 This one will set you back a mere 350,000IDR for an adult, and 230,000IDR per child over 3. We found the Super Fun Pass to be the best value! 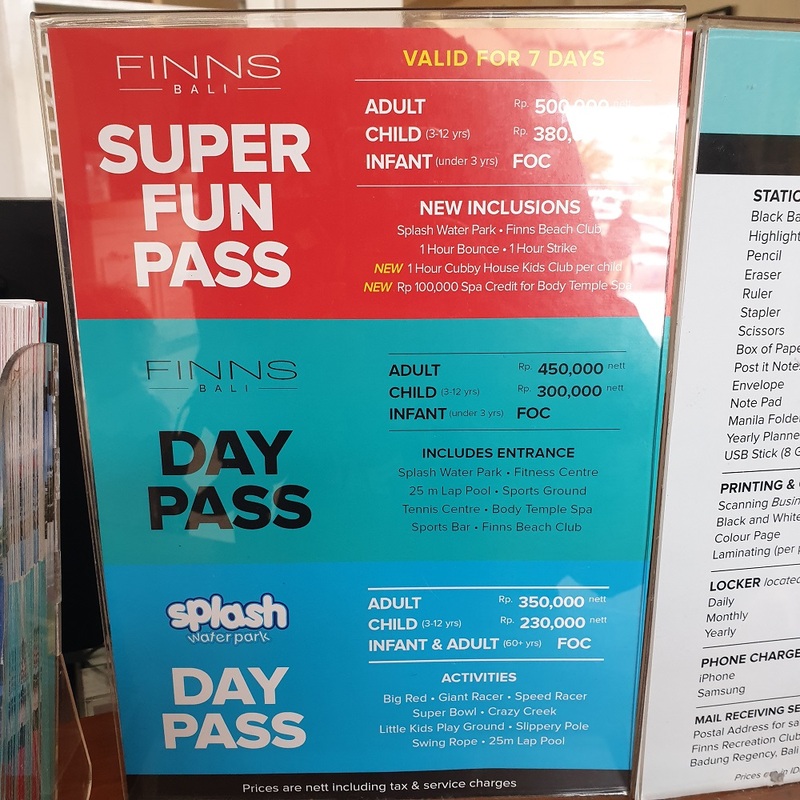 At Finn’s Rec Club, the jewel in their crown is definitely the excitement of Splash Waterpark. With the tallest slides visible across town, every kid around the block has seen them. They will inevitably beg Mum and Dad until they take them along to see them up close and very personal. In front of this there is a huge pool area to your left, and this includes some more fun for the kids as well as a place to relax. Here you will find a giant rope swing, and a slippery pole that you are invited to cross without falling off. There are pool attendants and lifeguards at every turn, encouraging the kids to have a go. To the right as you walk in you will see a 25m lap pool behind the gelato stand and bar. It felt right to keep the kids out of this one, as there were some serious lap swimming taking place. Follow the path on past the many comfortable and shaded daybeds and take your place overlooking the entire place. Looking up at the highest slides you see the Superbowl. This is the best and most fun of all the slides. The Superbowl sees you barrelling into a wide bowl before dropping into the deep pool below. Then there is Big Red which is a delightfully steady cruisy long ride to the pool below. Another set of miniature Speed Racer slides underneath round out the big set of fun at Splash. Underneath it all flows a steady and calming River Rapids tube ride, that was definitely my favourite. In front of the main slides, there is an entire section dedicated to the little ones. A gigantic bucket empties onto at least 5 small slides in knee deep water. These slides were super fast for grown-ups, but just right for our littlies. The little kid’s playground was awesome! From where you sit around the water’s edge on your comfortable day bed underneath your umbrella, you can neatly survey the entire park. This meant that I could simply kick back, relax and let the kids have all the fun. (Whilst still supervising of course.) 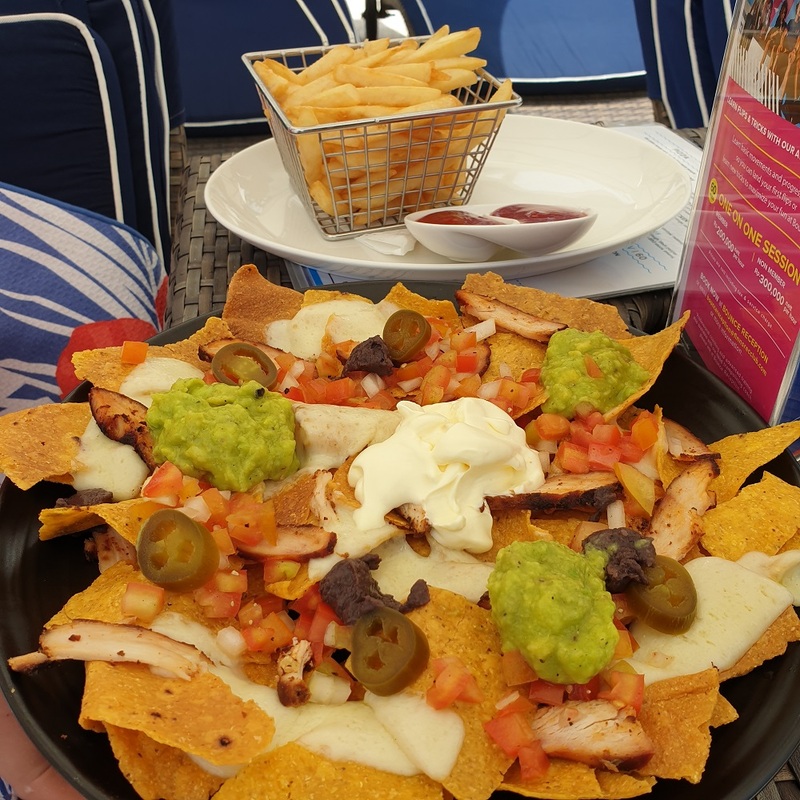 And the best part is the food and drinks could be delivered directly to my sunbed! Our 9, 7 and 5 year olds are very confident and capable swimmers. I felt fine about letting them go off on their own here. There was no lining up at all! You walk to the stop of the stairs and step straight onto a slide! I found it to be much easier than Waterbom from a supervision point of view. I really could see the kids everywhere they went! You can’t really compare Splash Waterpark to Waterbom. It is just not in the same ballpark. Some of the slides are looking a little bit tired if you look closely. But it is all sparkling clean and there is fresh paint on a few of the slides. This shows improvements are well underway. Where Splash wins though is the way it caters perfectly for younger children. Our kids absolutely loved it, and we didn’t have to worry about them. Older kids might be harder to please. But if your kids are under 10, then this is definitely the place to bring them. The bar/restaurant has great food and a classy atmosphere. The food is very tasty and well presented, albeit a little more pricey than we are used to paying for lunch. You can hire yourself a locker here for 25,000IDR and life jackets are available free of charge. 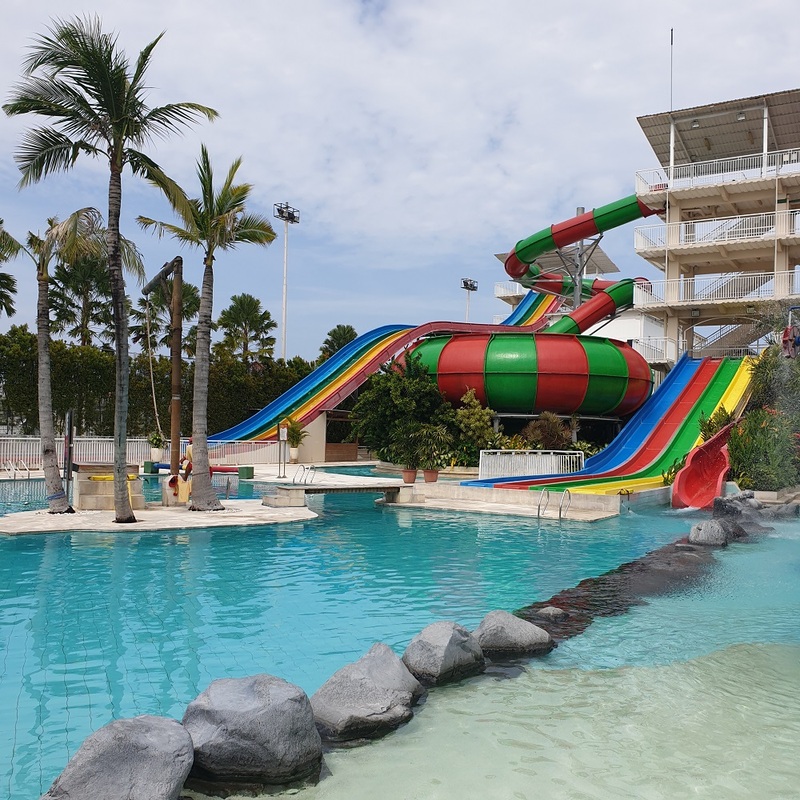 Toilets and change rooms are located way at the back of the waterslides. We spent around 2 fun-filled hours here. The kids didn’t want to leave of course, but we had other activities to do! You can do the activities in any order you wish of course. Next time I think we would start off with the bowling, then hit the trampoline centre. This will get you nice and sweaty. 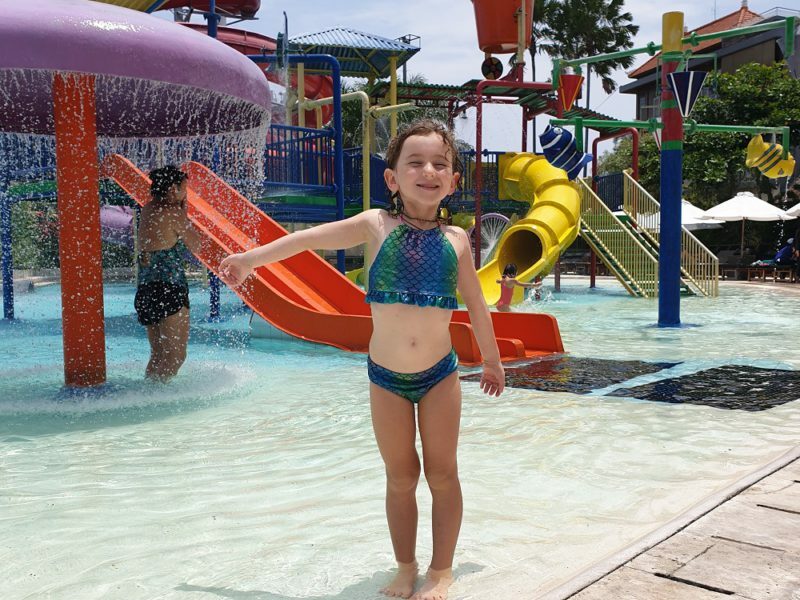 Finish off your day at Splash waterpark. That would make way more sense, but try telling the kids that! 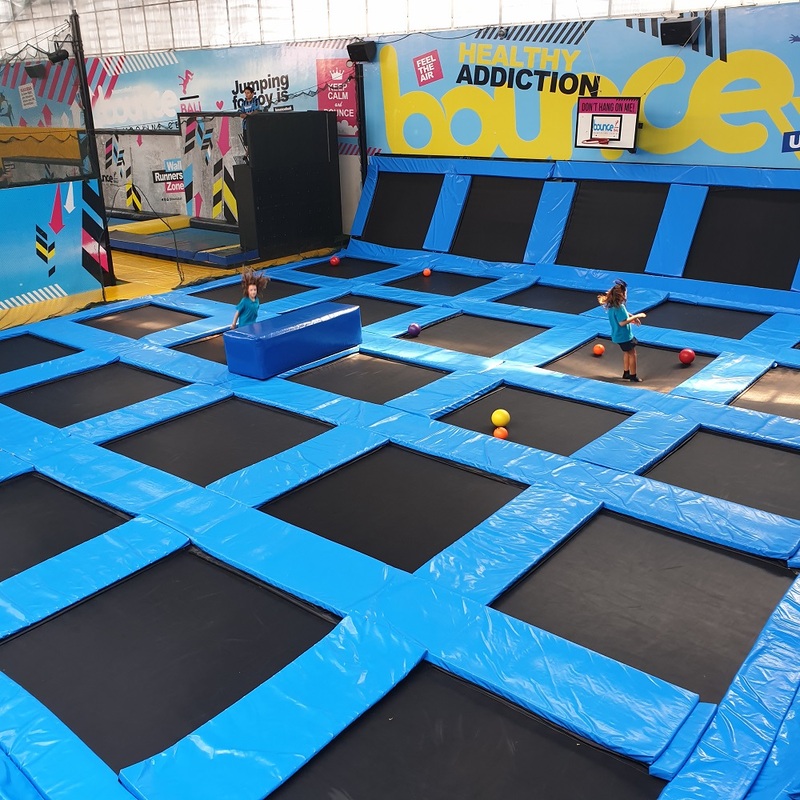 Our second stop was Bounce Now the awesome trampoline centre for an hour session. You have to catch a golf buggy from the front of Finn’s Rec Club, and go about 200m over the road to the trampolines and ten-pin. Tennis courts and child care are also located in this building. There is also an ATM conveniently located downstairs. You have to buy a pair of socks per person at the door which costs an extra 30,000IDR each. They have a special grippy sole, so you can’t just bring normal socks unfortunately. The Bounce sessions start on the hour every hour. You need to be lined up at the door at the session change to gain entry. There are lockers and shelves to store your belongings. Then you can enter the massive air-conditioned hall chock full of bouncy trampolines! There are hoops to shoot, flips to attempt and some super bouncy tramps to send you hurtling up walls. It is super fun, and needless to say, the kids were in their absolute element. The rooms are all very padded and there are attendants on site. They make sure everyone is behaving themselves so you feel safe. If you don’t want to bounce, you can view your loved ones from the safety of the upstairs gallery. There is even a bar! This place is great for relaxing after your Splash and your Bounce. There is a bar for refreshments, and shoe hire is included in your ticket price. Socks are not included and are compulsory so make sure you remember to bring your own, or you will have to buy a pair for 25,000IDR. We had a couple of low key games trying to help the kids and getting in some strikes of our own, but the children were so tired by this point, and we could bowl no more. The passes are valid for 7 days so we could have just saved these bowling passes and used them on another day where we felt more fresh, no worries. 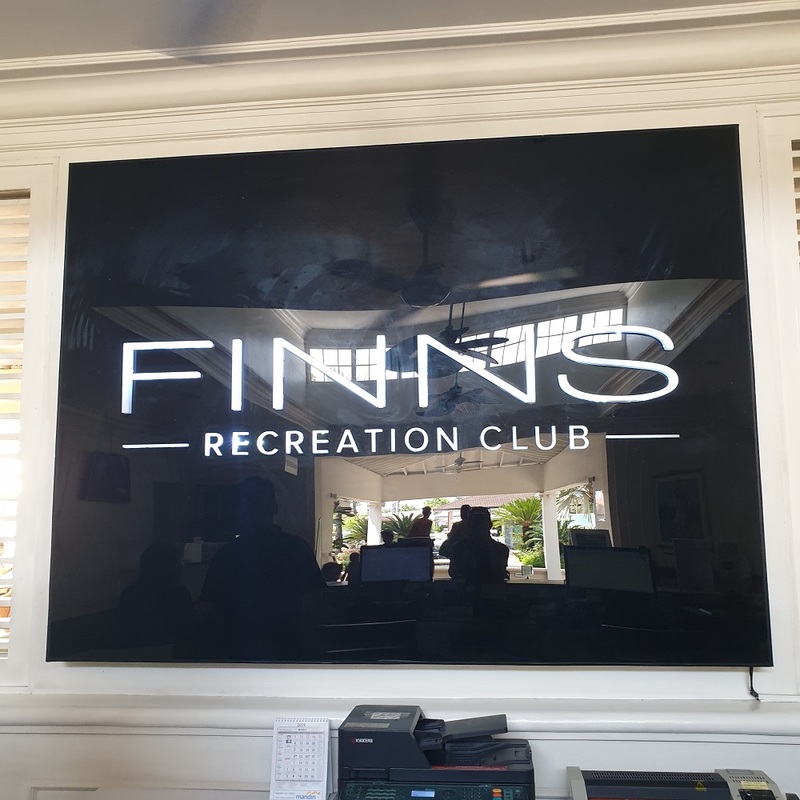 Visiting Finn’s Beach Club was quite an experience. Finn’s is where all the cool people hang out. It makes you feel like if you are anyone, you will be at Finn’s right now. They were quite tight with their security which was cool. You can have an icy cold beer poolside, while overlooking the surf at Berawa Beach, surrounded by beautiful people and pumping tunes. 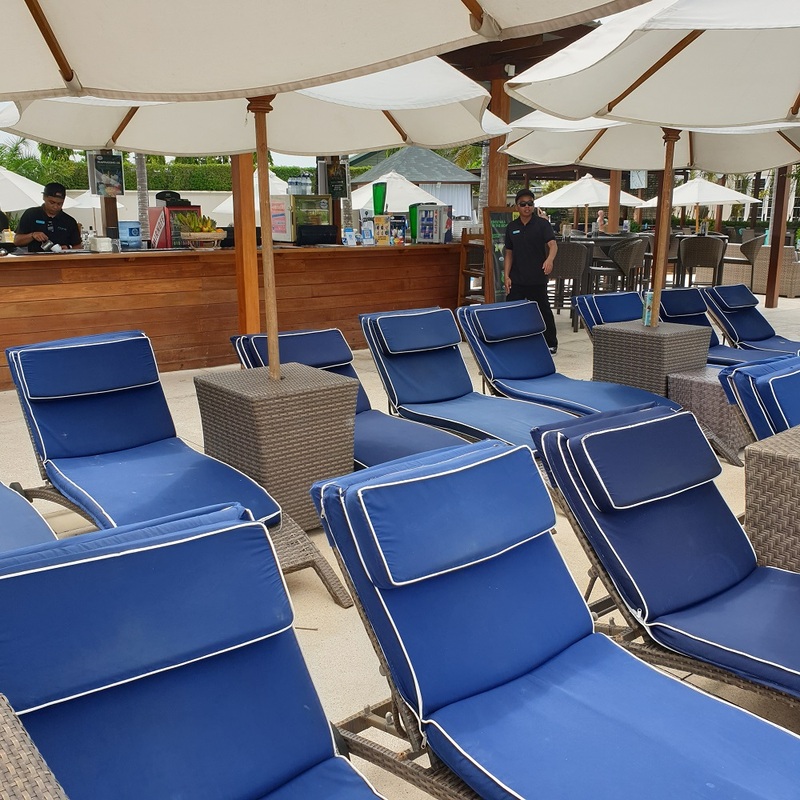 The day beds are usually reserved for a minimum spend, and there is a VIP area for if you spend even more. Daily and weekly passes are available, and there is childcare and merchandise available. There is also a separate restaurant. 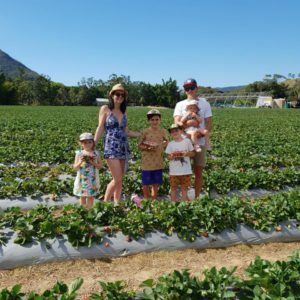 Finn’s was undergoing renovation when we visited so next time it will be even better! There is nothing for the kids to do here except swim in the pool and people watch, so that is exactly what we did. There is a shuttle bus which takes you to and from Finn’s Rec Club. 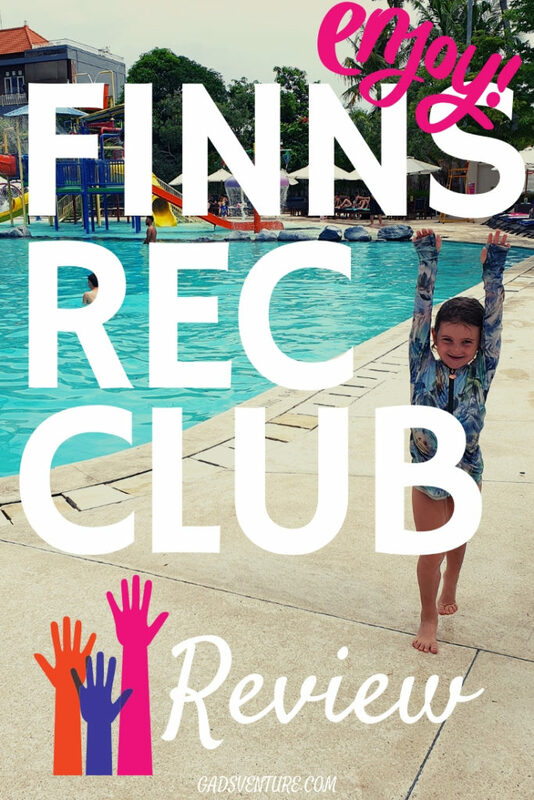 For a fun and reasonably priced day out with your kids, you can’t go past Finn’s Rec Club. It is so easy to get to, and great that you have 7 days to use elements of your pass, so you don’t have to wipe yourself out all in one day. I would recommend using the Bounce BEFORE Splash though as you do get pretty sweaty! I didn’t like having to pay extra for socks, I think that would be better off being included in the price of the ticket. So worn out and happy! But overall, it was an awesome day, and with happy, tired kiddos, we all slept very well that night! 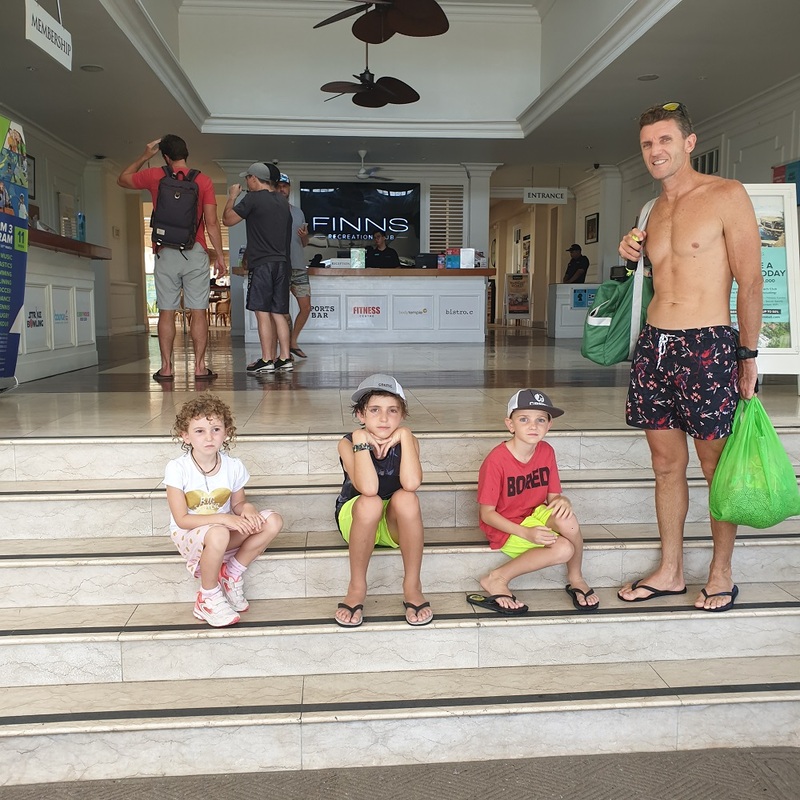 Definitely add Finn’s Rec Club to your Bali Itinerary!